Hurricane Irma slowed to a category three storm as it crashed across Cuba’s northern coast, lashing towns with 125mph winds and flooding them with intense surges. As of midday local time, the storm was about 170 miles away from Florida, and expected to regain category four intensity. More than seven million people were ordered to flee from their homes in several states, including nearly a third of Florida’s population. More than 50,000 people are in about 300 shelters around the state, counties enacted curfews, and power providers already began to struggle with demand. Florida prepared for what its governor called “the most catastrophic storm the state has ever seen”. Irma is forecast to make landfall on the Florida Keys early Sunday morning and then to pummel south-west Florida on a 30-hour journey northward. Twenty-five people have been confirmed killed around the Caribbean, including 11 people on French St Martin and St Barts, four in the US Virgin Islands, three on Puerto Rico, two on Dutch St Maarten, one person in Anguilla and a two year old in Barbuda. Category-four hurricane Jose threatened landfall in the eastern Caribbean, complicating relief efforts for islands that have only just emerged from Irma’s winds. On Barbuda, where the prime minister estimated 90% of buildings were destroyed, a mandatory evacuation moved people to the larger sister island of Antigua. Another storm, Katia, was downgraded to a tropical depression as it pushed onto land from Mexico’s Gulf coast. Two people were killed in a mudslide in Veracruz, according to the AP. The situation keeps changing in Florida as Irma looks like now going up over the keys and then up the west coast, depending on when an dhow much it veers north. Irma will regain strength as it moves away from Cuba, with winds predicted of more than 110mph by the time it reaches the Florida Keys early Sunday. The latest projections from the National Hurricane Center show the storm moving at about 9mph, with winds of 125mph, still over Cuba’s northern shore. The hurricane has not yet turned north back over warmer waters. Irma’s current projected course shows the eye making landfall three times on Florida: first over the Lower Keys, where meteorologists expect devastating storm surges; then over Cape Coral or Fort Myers, in south-west Florida; and finally it is expected to come within range of Tampa Bay, the state’s third most populous city. This will play out slowly of the next three days, it has been a slow motion wrecking storm. Of course inflation, increased population and increased industrialisation need to be taken into account. And this is just the US costs, hurricanes ending up hitting the US coast have often already wreaked havoc in the Carribean. And the cost of Harvey is yet to be determined accurately. Five days ago an estimate was $108 billion – see Harvey is likely to be the second-most costly natural disaster in U.S. history. And there’s more bad news – Hurricane Irma is growing in strength and heading for Florida, passing by a number of Caribbean islands on the way. Hurricane Irma is an “extremely dangerous” Category 5, barreling toward the northern Lesser Antilles and Southern Florida. It’s already the strongest hurricane ever recorded outside the Caribbean and the Gulf of Mexico, and it’s likely to make landfall somewhere in Florida over the weekend. If it does, the impact could be catastrophic. 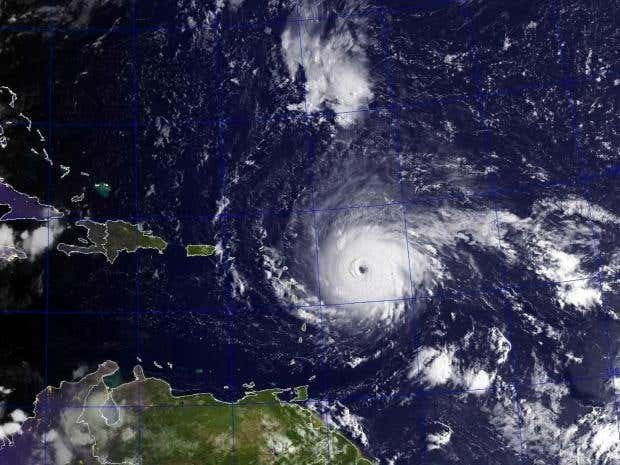 The storm is life-threatening for the United States, including Puerto Rico, the U.S. and British Virgin Islands, the Dominican Republic, Haiti, Cuba and the southeastern Bahamas. Hurricane warnings have been issued for the northern Leeward Islands, Virgin Islands, and Puerto Rico. A hurricane watch is in effect for Hispaniola and southeastern Bahamas. And inevitably these hurricanes raise a bigger storm, climate change debate. As Irma looms, Harvey makes climate change clearly visible. Hurricane Harvey is the biggest rain event in the nation’s history and could turn out to be one of the most destructive storms ever. Thousands of people are out of their homes, the death toll has been climbing, and people are still being rescued. The magnitude of Harvey shows the impact of climate change. The Gulf of Mexico has increased in temperature because the planet is getting warmer, which made the storm catastrophic. Harvey is the symbol of what climate change impacts look like. Harvey brewed in the Gulf of Mexico, but Irma is coming in off the Atlantic Ocean. Water temperatures at the surface of the Gulf of Mexico and near South Florida are on fire. They spurred a historically warm winter from Houston to Miami and could fuel intense thunderstorms in the spring from the South to the Plains. In the Gulf, the average sea surface temperature never fell below 73 degrees over the winter for the first time on record, reported Eric Berger of Ars Technica. Galveston, Tex., has tied or broken an astonishing 33 record highs since Nov. 1, while neighboring Houston had its warmest winter on record. The abnormally warm temperatures curled around the Gulf, helping Baton Rouge and New Orleans reach their warmest Februaries on record. Meanwhile, a ribbon of toasty sea surface temperatures streamed north through the Straits of Florida supporting record-setting warmth over parts of the Florida peninsula. The implications of the warm water for hurricane season, June 1 to Nov. 30, are less clear. The implications seem to be more clear now.